At Davis Dodge, you could find yourself behind the wheel of a Chrysler 300.Bold, striking and sophisticated, the Chrysler 300 is the best-in-class V6 highway and AWD fuel economy. The Chrysler 300 comes in Touring, Limited, 300S, 300C and 300C Platinum.Talk with one of our representatives today, and learn why vehicle buyers come from Calgary, Lethbridge and Claresholm for a shopping experience at Davis Dodge. 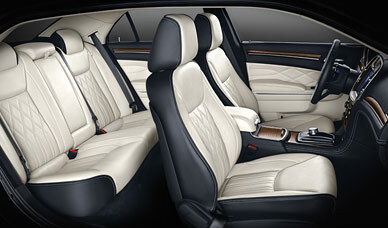 The Chrysler 300 offers you exceptional comfort and convenience. Indulge in available features like heated and ventilated front seats, a heated, wood and leather-wrapped steering wheel, and heated/cooled front console cup holders. 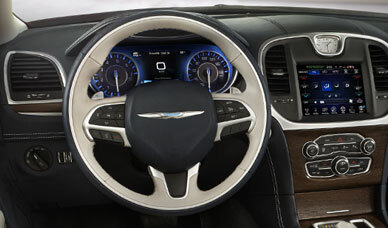 Standard on every Chrysler 300 is a 3-spoke, leather-wrapped steering wheel with large, illuminated vehicle controls. Die-cast paddle shifters and a unique chrome accent ring are available for an enhanced look, feel and driving experience. 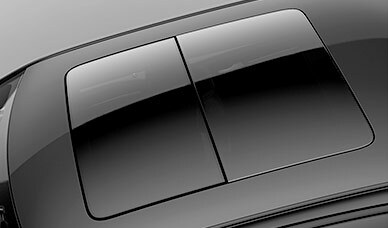 Let your passengers take in all the scenery with the available dual-pane panoramic sunroof that extends front to rear. The lines of the 2016 Chrysler 300 highlight the evolution of the full-size sedan. The front end, strong shoulder lines, sculpted taillamps, and front and rear fascias make a statement with an unforgettable road presence. The high beltline stays true to its signature proportions, and a multitude of bold exterior trim options hint at the luxury that resides within. The 2016 Chrysler 300 continues the evolutionary design that changed the game. Its prominent shape features dimensional grille textures surrounded by available bright, black chrome, chrome and platinum finishes. The signature Chrysler wing badge floats within the grille texture for a striking look. The Chrysler 300 features sculpted taillamps and daytime running lamps with LED lighting technology. The lamps form a "C" shape up front and a unique illuminated halo out back for a signature look all around. LED fog lamps are available to add even more on-road presence. The array of 8 head-turning wheel designs range from the standard 17-inch Tech Silver aluminum wheels on Touring RWD, to the stunning 20-inch Hyper Black wheels standard on the 300S RWD model. The wheel configurator will help you find a wheel to match your personal style. The 2016 Chrysler 300 delivers impressive fuel economy as efficient as 7.7 L/100 km (37 mpg) highway. The 2016 Chrysler 300 is the only vehicle in its segment to offer a V6 or V8 engine with a standard 8-speed automatic transmission. The state-of-the-art TorqueFlite® gearbox provides world-class shift quality, refinement and fuel efficiency. Add the available die-cast, steering wheel-mounted paddle shifters for an enhanced driving experience. The Chrysler 300 has the most technologically advanced AWD system in its class for superb handling, all-weather capability and Best-in-Class AWD fuel economy as efficient as 8.6 L/100 km (33 mpg) highway. This available feature utilizes a Segment-Exclusive active transfer case with front axle disconnect to improve fuel economy by disengaging the front wheels when AWD is not needed. The standard electric power steering system continually adjusts its feedback and feel for optimal performance at any speed. The system makes precise tuning adjustments for highly responsive feedback during spirited driving, and is easy to steer for slow-speed functions like parking. The 2016 Chrysler 300 can change its performance with the touch of a button. The available Sport mode dramatically reduces transmission shift times, sharpens engine and throttle response, and enhances steering feedback. It's functionally ergonomic and visually pleasing. It's the Class-Exclusive Rotary E-shift dial. With the twist of the dial, you effortlessly toggle through all the gear selections for sophisticated ease of operation. Every Chrysler 300 comes equipped with the advanced Uconnect® 8.4 multimedia centre. The system features the easy-to-use 8.4-inch touchscreen that is the largest in its class. It keeps you connected with hands-free communication and Bluetooth® streaming audio, a media hub including remote USB port and auxiliary input jack for access to your portable devices, and available 3D navigation. The 7-inch customizable full-colour in-cluster display centre keeps you informed of essential vehicle data and features a wide range of customizable views. This standard innovation provides displays for real-time performance data, audio selections, vehicle status, trip information, system alerts, available turn-by-turn navigation and much more. Every model comes standard with hands-free communication and Bluetooth® streaming audio. This feature enables you to keep your hands on the wheel while changing music, making phone calls, sending text messages, and inputting destinations into the available navigation system. The BeatsAudioTM premium sound system comes equipped with a 12-channel amplifier with 552 watts of power. The 10 speakers include an 8-inch, centre-mounted subwoofer in the rear shelf for a truly inspiring soundtrack. It is available on 300 Limited and standard on 300S. The available Adaptive Cruise Control automatically adjusts the speed of the vehicle to maintain a safe, driver-selectable distance to the vehicle ahead. It has the ability to bring the vehicle to a complete stop, hold for 2 seconds, and then resume with traffic. If the vehicle is stopped for longer than 2 seconds, an audible chime alerts the driver to press the Resume button to continue driving at the pre-set cruise speed. The available Forward Collision Warning with Active Braking uses cutting-edge radar and camera technology to detect whether the Chrysler 300 is approaching a vehicle or large obstacle in its path too rapidly. When an object is detected, the system provides audible and visual warnings and assists the driver in avoiding it by actively applying the brakes. The driver has the ability to adjust the sensitivity and brake support activation. If you unintentionally drift out of your lane without using the turn signals, the available Lane Departure Warning with Lane Keep Assist will alert you visually and via a slight vibration in the steering wheel. If no corrective action is taken, the system can automatically realign the vehicle to the proper lane position using the standard electric power steering. When in Reverse, the available ParkView® Rear Back-Up Camera displays a high-resolution image of what is behind the vehicle on the touchscreen and uses dynamic grid lines to steer you safely into place. The available Park-Sense® Front and Rear Park Assist9 adds another layer of safety. Through sensors that detect objects in your path, it provides a visual reference in the 7-inch customizable full-colour in-cluster display centre in addition to an audible chime that increases in intensity as you get closer. The available Blind-Spot Monitoring system will alert you with an audible alert and visible icon in the sideview mirror if there's a vehicle in your blind spot during lane changes with the turn signal activated. Included with the system is Rear Cross-Path Detection, which performs a similar function when backing out of a parking spot by detecting approaching vehicles from either side. Keyless Enter 'n GoTM with proximity entry and push-button start comes standard on the Chrysler 300. It allows you to open, lock and start the vehicle while the key fob remains in your pocket or purse. An ultrasonic security system also comes standard and includes an anti-tilt feature, which sounds an alarm if the vehicle is towed or raised on jacks.